Chicken Jambalaya was a recipe my mum found, and we were both really up for giving it a try. It is described as a Creole recipe and is said to originate in Louisiana, USA. It does kind of remind me of Paella a little bit though. So yesterday, we decided that we would give this dish a go ourselves! It was fairly easy to make, although we both felt it might have been easier to cook the rice first then let it absorb the flavours of the sauce instead of cooking rice in chopped tomatoes which did take a very long time - next time we make it I think we will cook the rice with stock then add that to the rest of the recipe to make it a little bit easier on ourselves. Cook the chicken, and cut the peppers, onions and garlic and put into the pan to begin to fry off - the recipe says to use sunflower oil, but we decided on fry light instead. Add in the chill powder (we opted for 1/2 tsp but next time I will go for 1 tsp). Let this cook for a few minutes. Put in the chopped tomatoes and stock cube. Bring this to the boil and then reduce the heat so it does not burn. Cover with a lid so it can simmer. After it has simmered for 15 minutes, add the cooked chicken, cover once more and cook for roughly 10 more minutes so the rice has time to properly cook and go tender. Once the rice is done, season with Tabasco Sauce and spring onion. The recipe also suggested having peas on the side which we unfortunately didn't have in but next time we'll do this because I think it would go really well! 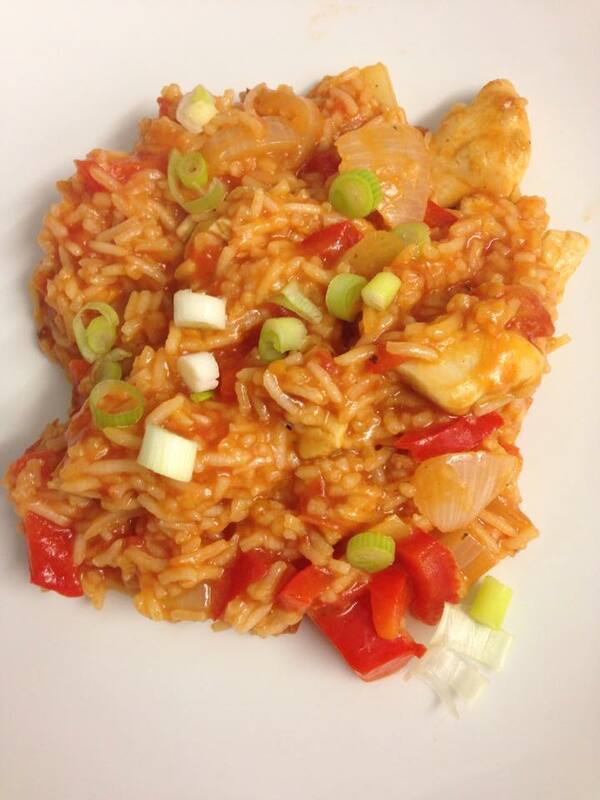 Chicken Jambalaya is a reasonably quick, delicious and fairly healthy dinner to make. I really enjoyed it and will definitely be making it again. It might even make a nice lunch for when I am at work although I think I would make it primarily vegetable based so I didn't get too sleepy in the afternoon! Have you ever had Chicken Jambalaya? Do you like the sound of it?